One of the deceptive tricks of Satan is to foster gossip and slander among people of faith about each other. When one spreads gossip or slander you emit a threefold poison: it injures the teller, the hearer, and the object of the gossip or slander. Whether the report is true or false, we are forbidden by God's word to spread it. The reputations of the Lord's people should be very precious in our sight, and we should consider it shameful to help the devil to dishonor the church, the name of the Lord and God's people by engaging in gossip and slander. Let this be our family rule and personal agreement - Slander no one! "The church must be reminded that it is not the master or the servant of the state, but rather the conscience of the state. It must be the guide and the critic of the state, and never its tool. If the church does not recapture its prophetic zeal, it will become an irrelevant social club without moral or spiritual authority." Put People to Work - Now! The word is out. The people of 21217/21201 have come together and organized to become a part of the work force in the State Center Project. The Baltimore Afro has done a front page story that outlines the issues involved. In physics for every action there is a reaction. The question is what will the reaction be: will the forces open up the process and provide jobs to the local residents or will they use the age old excuse we cannot find qualified people? The faith community has done the work. We have a comprehensive listing of people who are ready, able and willing to work who live in the neighborhood. We shall continue to insist that our local residents are hired. On Wednesday, December 1st the approval and funding for the underground garage goes before the Board of Public Works. We will find out directly from the Governor if local hiring will be a reality in this project. I pray that it is for the people who live within the community who need to work. Everybody wants a job! Now!!!! "Whatever your hands find to do," refers to works that are possible. There are many things which our heart finds to do which we never should do. It is well it is in our hearts; but if we would be eminently useful, we must not be content with forming schemes in our heart, and talking of them; we must practically carry out "whatever our hand finds to do." One good deed is worth more than a thousand brilliant theories. Don't wait for large opportunities, or for a different kind of work, but do just the things we "find to do" day by day. We have no other time in which to live. The past is gone; the future has not arrived; we shall never have any time but time present. Then do not wait until your experience has ripened into maturity before you attempt to serve God. Endeavor not to bring forth fruit. Serve God now, but be careful as to the way in which you perform what you find to do - "do it with all your might." Do it promptly; do not fritter away your life in thinking of what you intend to do tomorrow as if that could compensate for the idleness of today. No one ever served God by doing things tomorrow. If we honor Christ and are blessed, it is by the things which we do today. Whatever you do for Christ, throw you whole soul into it. Do not give Christ a little slurred work, done as a matter of course now and then; but when you do serve Him, do it with heart, and soul, and strength. But where is the might of Christians? It is not in ourselves, for we are perfect weakness. Our might lies in the Lord of Hosts. Then let's seek His help; let's proceed with prayer and faith, and when we have done what our "hands finds to do," let's wait upon the Lord for His blessing. What we do in this manner will be well done, and will not fail in its effect. "words by Rev. Dr. Charles Spurgeon"
Had the opportunity to have a discussion with two successful African American Males, both under the age of 27 years. Between them they have collectively earned 9 degrees. One works for the government and the other works for corporate America. Both are from Baltimore and both attended Calvert Hall College and then West Virginia University. We were laid back watching the WVU versus Pitt football. During the game I asked a few reflective questions. What preparatory experiences during your high schools years helped you in college and beyond? What did you learn in college that has been beneficial to you in your careers? To the first question, it was shared that the discipline of Calvert Hall propelled them through college and beyond. Learning in a multi-cultural environment gave them a tremendous advantage at WVU. Learning how to use the free periods at Calvert Hall helped them with time management when they were in college. Learning how to pick friends gave them lifelong associates who pushed each other to succeed. In college they found that other students didn't take advantage of the free tutoring assistance provided. They invested two hours each day in the free tutoring sessions. They found that being on top of their subject areas didn't prohibit them from having fun and participating in extra curricular activities. Obtaining an international learning experience while in college proved to be helpful. Having goals that for them meant education was a stepping stone. Not seeing simply graduating as the mark of success, but obtaining the career that they wished as the success mark. They explained that they witnessed two many of their colleagues having short sighted goals: just getting into college or just getting a degree. Their goals where to obtain positions within the areas they had chosen for their careers. Finally having multi-cultural friendships taught them how to engage people from different cultures and backgrounds. In closing understanding that the competitors for jobs and positions come from all over the world. They had to meet a global standard for academic and professional achievement. I left the conversation feeling pretty goal about these two young men. I was proud as a peacock, knowing that they will provide leadership for our community and world in the future. Happy Thanksgiving, indeed! The National Bible Association designated Baltimore City as its National Bible City. On Monday, November 22nd, prior to the time of the historic march for jobs in Baltimore, I had the honor of participating in Scripture reading in front of City Hall. It has been proven that the regular reading of the Bible at least four times a week has a positive impact on one's moral character and actions. We don't have to force religious practices down anyone's throat. We shouldn't be ashamed of our religious and biblical foundation. We are in perilous times when the eternal truths contained in scripture should be hung on the door-posts of everyone's home and in everyone's hearts. I have come to learn that when a person accepts the responsibility for being a minister within an urban community; you have to come out of your comfort zone and go where the pain, injustice, and marginalization most affects people. It's a moment when theory must become reality. 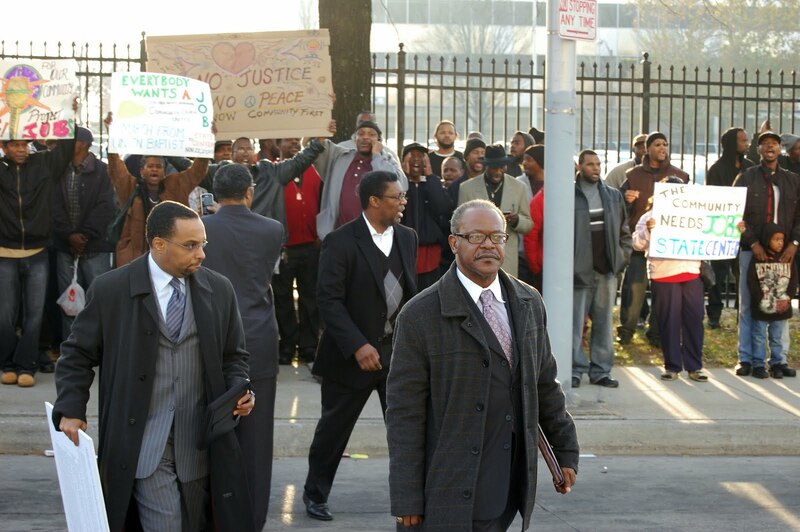 It's a moment when one has to take a risk for truth, justice, and the "Beloved Community." The idea of "The Beloved Community" has lost traction during this era of individualism, Tea Party, and racial disunity. Nevertheless, if our form of republic is to be great; we must never cease striving towards the vision of America The Rev. Dr. Martin Luther King, Jr. expressed in his dream over 57 years ago on the steps of the Nation's Capital. Yesterday, I struggled with the same feelings he must have felt. I wrestled with the hesitancy to step outside of my comfort zone. I faced the demon of apathy. I felt the tension people feel when they believe they have no power to make a difference in their lives and the community.After much prayer, introspection, and searching of the scriptures; I came to the conclusion that "enough is enough." No longer will I stand on the sidelines waiting for someone to take on the mantle of leadership within our community. No longer will I criticize and ostracize others for what they did or didn't do. 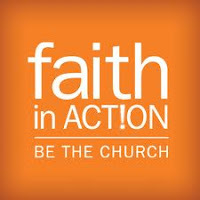 Along with my fellow clergy persons, I stepped out on faith with the belief that there is a better way. Persons within the community are seeking an outlet for their voice. Persons in the community desire a better way of life. 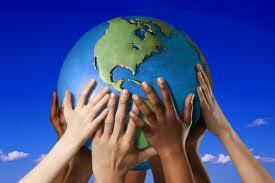 Persons in the community have power when they are organized. We demonstrated that you can deliver over 800 hundred people in a public action to address the conditions that impact them. We demonstrated that the church is not only a place of worship, but also a place of empowerment. We marched in an orderly manner to the State Center Project to express our demands, "That Everybody wants a job!" WBAL-TV11 recorded the action. Through their lens the people in power and the people within the city were able to see that the residents are organized and have the support of the faith community to press their claims for full employment. You would have been proud of our people. They operated in a civil, but forceful way. They were heard throughout the State House and City Hall. As we continue this movement for justice and jobs, their voices will echo to the White House and Wall Street. America has to put its people to work. The State of Maryland has to insure that local residents obtain the jobs funded within their local communities. The City of Baltimore must insist that public investment requires public participation in the benefits derived. "Everybody wants a job!" 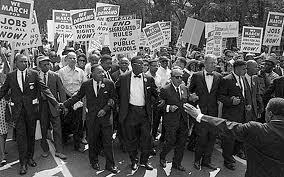 This picture is intended to remind us that a key aspect of the Civil Rights Movement was to demand jobs for people. Religious leaders understood the connection between full employment and healthy communities and families. Our ancestors were willing to put their faith into action. Their Sunday worship experience fueled their desire to create change within the social and economic fabric within their communities. America and many local communities are going in the wrong direction. They believe that communities can be transformed through physical development without the spiritual uplift and development of the local residents in those communities. This is a formula for failure. Physical development, economic development and spiritual development are integrally tied together. That why on Monday, November 22nd at 3:00 p.m.
Clergy and community members will march to the site of the proposed first Phase project of the State Center. This $1.6 Billion dollar project is being planned without a bona fide plan for including local residents in the jobs and economic benefits that will be derived from it. We must march to highlight the needs of people who want to work and need to work. We must march to demonstrate that our communities can be organized and collectively pursue positive goals. We must march to insure that hopelessness does not fester into apathy. We must march to show the powers that be that the "sleeping giant" is now awake. We must march to let everybody know that the residents of West Baltimore will continue to demonstrate in a public way until they get the jobs being created on this project. The revolution will not be televised. We intend to have 1,000 people march from Union Baptist Church to 400 West Preston. If you want to join in the march for jobs, we will leave from Union Baptist Church tomorrow beginning at 3:00 p.m. The wait is over. 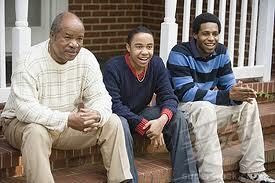 This Sunday, November 21st, the 11:00 a.m. preacher for Men's Day at Union Baptist Church will be Rev. Dr. Cleophus J. Larue. 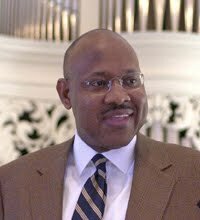 He is a professor of homiletics at Princeton Theological Seminary. If you have not heard this teacher of preachers, you should come to 1219 Druid Hill Avenue tomorrow and experience one of the finest preachers in America. Fresh from attending the Annual Meeting of the Academy of Homiletics in Atlanta, Ga., he is in town for one day only to proclaim the word of God. A special men's day choir under the direction of Mr. Marco Merrick will sing. The theme: "Union Men: Empowered by their history to serve God." The Men of Union have a rich history upon which they can extend the ministry of service to the residents of the Beloved Community. I'm leaving for New York to speak at the Annual Gala of the National Bible Association on Thursday, November 18th. From November 21st to the 27th will be National Bible Week. The week of Thanksgiving since 1941 has been designated as such by every American President. President Barack Obama will also designate next week as National Bible Week. To commemorate that week, Baltimore will host an interfaith concert on Sunday, November 21st at the Basilica of the Assumption in Baltimore. On Monday, November 22nd I will join with interfaith leaders from across Baltimore in the reading of Scripture from the Balcony of Baltimore's City Hall. Sister Mahalia Jackson would sing, "I found the answer. I learned to pray. Take your Bible with you and read it everyday." It has been proven that the regular reading of the Bible increases one's moral character. I use to say when one of our giants leaves us that it is a lost. In the case of Mr. Mack Lewis, he deposited some much of himself in so many that he will live on. Mr. Lewis was the originator of "street creditability." He earned his reputation by staying in the community and taught wild young boys what it meant to become a man. He was the "godfather" who did not abuse his power, but used his wisdom and assistance to steer young men in the right direction. I was blessed to interact with him on many occasions. I always stood in awe of this man whose legendary status waxed right before my eyes. 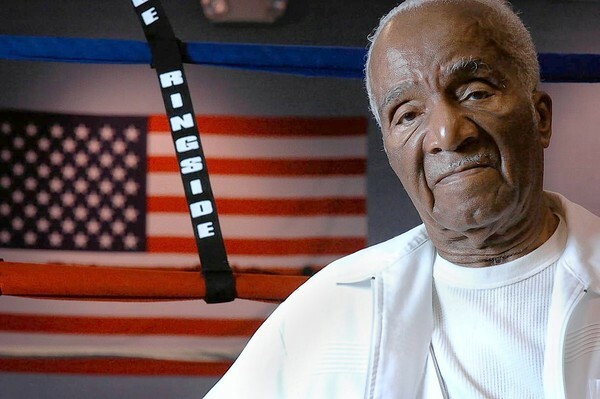 Boxing was his tool to reaching hard headed young men. Young men who he taught that being macho was not how hard you could hit someone else. He taught being macho was how well you could serve someone else. Many men learned the lessons he taught. Each one who gleaned from his wisdom; is richer indeed. Mr. Mack Lewis, the man! You are receiving plenty of advance notice. Next week the magic moment arrives. The United States Naval Academy Gospel Choir will be in concert at Union Baptist Church, 1219 Druid Hill Avenue on Sunday, November 21, 2010 beginning at 4:00 p.m. I would suggest the you arrive at least 45 minutes early to get a good seat. This fantastic choir is touring around the United States and is making a special appearance in the Historic Union Baptist Church. If you want to hear a sampling of their music, you may click onto this link which will take you to UBC's home page. You will see a link on that page which will allow you to listen to one of their songs, "The Lord is in this place". 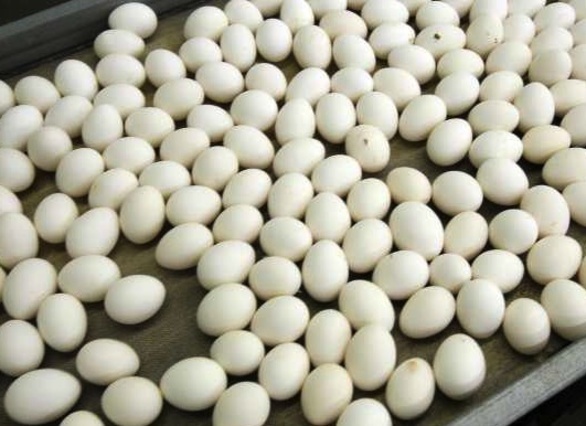 One time all you would ask is "what came first the chicken or the egg"; but in these days and times you have to look at your eggs and wonder if they are contaminated with salmonella. Profits and genetic alteration of our growing process, as well as, slack regulation of our food production chain has put the consumer at the behest of the food producers. I long for the time when we produced and grew our own foods and animals on family farms. Some of us may remember going to the "country" and visiting our relatives. Walking their vegetable fields, or climbing in their orchards, or chasing the chickens in the coop; these experiences, for some, are a distant memory. For others there is no memory at all. But, we use to live in simpler times. We use to live closer to nature. It seems the further away from nature we get; the more distant God is. Take a ride into the country, drive through the mountains; never forget that "the earth is the Lord's and the fullness thereof and all they that live therein." 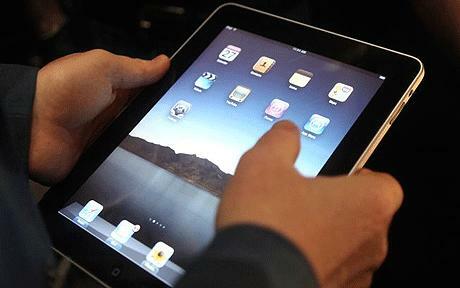 Have you given in to the urge to buy an IPad, or have you resisted the urge? Was it because you didn't need another trinket to learn or carry? Or, was because of the high price of all these items in the marketplace that supposedly you can't live without? I must admit I bought an Adroid phone, but I have not purchased an IPad. Why, I'm protesting how technology is taking up so much of my time and weaving its way into the fabric of my life. I'm concerned! As a result I've found myself spending more time in the library. I try to spend at least four hours per week in St. Mary's University and Seminary's library. I'm reading more books at home. I'm concerned that the inward journey created by technology is turning a generation of people into introverts. How do you say hello to someone when they have ear plugs in their ears? How do you look someone in the eye when they are constantly watching their cell phone or texting? I'm making it a habit to write at least ten letters each week. Because of email and texting we are losing the art of letter writing. What are you doing to resist the temptation of techonology taking over your life? Or, are you too far gone that it doesn't matter!